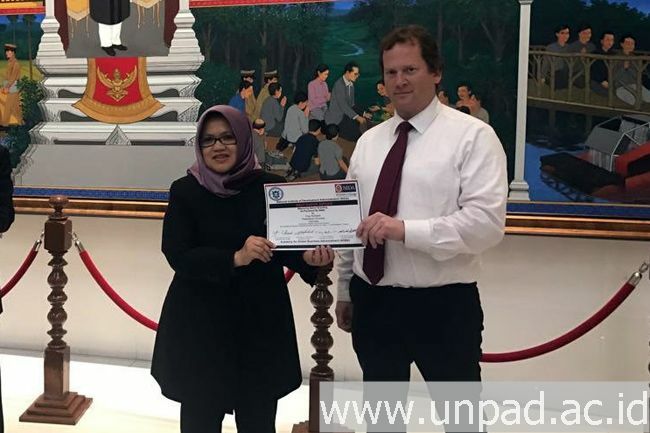 [unpad.ac.id, 6/7/2018] Lecturer at the Faculty of Economics and Business Padjadjaran University Popy Rufaidah, MBA, PhD., won three international awards at the 15th World Congress of Academy for Global Business for Advancement (AGBA) at the National Institute of Development Administration (NIDA) Thailand, Monday (2/7) to Wednesday (4/7). Lecturer at the Faculty of Economics and Business Padjadjaran University Popy Rufaidah, MBA, PhD, received an award from the Conference Director and Program Chair Academy for Global Business for Advancement (AGBA) Prof. Christopher J. Marquette at the 15th World Congress of Academy for AGBA, at the National Institute of Development Administration (NIDA) campus, Bangkok, Thailand, Monday (2/7) to Wednesday (4/7). The three awards are as follows: AGBA Distinguished Scholar, AGBA Best Paper Award, and AGBA Best Paper Undergraduate Research Paper Award. AGBA Best Paper Award was awarded to Popy for her research presentation entitled “Measuring Nation Branding as Perceived by SMEs” in the Congress. This research measures the identity of a country from the perspective of micro, small and medium enterprises. The research was conducted to 250 business players in fashion, culinary, and other services from 27 cities/regencies in West Java. Popy explained that every business is asked to evaluate Indonesia based on 6 indicators, namely: tourism, exports, governance, investment, living conditions, and human resource quality issues. “The recommendation of the research is that the Indonesian government to identify indicators that can shape the positive image of the Indonesian state in the public, so that investors can increase investment options in Indonesia based on these indicators,” Popy said when interviewed by Unpad Public Relation, Wednesday (4/7) ). This research was appraised positive by assessment team consisting of Prof. Norman Wright (Board of Trustee AGBA), Prof. Jafar U. Ahmed (President of AGBA), Prof. Gary L. Frankwick (University of Texas el Paso); Viput Ongsakul (Dean of NIDA). The awards were given directly by Prof. Norman Wright with the other assessment team members to Popy. The AGBA Distinguished Scholar Award was awarded based on her distinguished academic leadership in improving student quality as seen by the acquisition of AGBA Best Paper Undergraduate Research by Annisa Alifa Khair, Unpad Management Students who is under her supervision. The award was given for the thesis research entitled “The Effect of Country of Origin and National Image on Consumer Trust” by Annisa with Popy. The results of the congress will be published in the Scopus indexed journal.